Bright Tangerine Misfit ATOM 4x5.65" and 4x4" Ultra Lightweight 2-Stage Clip-On Matte Box with Detachable Lens Shade, 114mm Clamp Attachment. Misfit ATOM Taking lightweight to the limit To create the lightest matte box possible, we stripped it down to the core. Almost weightless, Misfit ATOM gives you more possibilities than ever before. Designed with gimbals and Steadicam in mind, it's exceptionally small, light, and affordable too. Lighter than light Every gram counts Misfit ATOM weighs just 98g without the shade, and 195g with it. That's less than a quarter the weight of a standard Misfit or LMB25. Gimbals & Steadicam Making the impossible possible When you're pushed for weight, you won't need to tape a filter to the lens anymore. With Misfit ATOM you can remove the shade and just use it as a filter holder. It's safer, quicker, and a whole lot more. Retractable Top Flag Lightweight light control The lightest Mattebox in the market just got heavier on features. The custom built carbon fibre top flag gives your Misfit ATOM better light control and helps improve contrast and resolution. The top flag is easily retractable for use with or without the shade and barely adds any weight to your kit. A unique filter system Thinking outside the box The tray less filter holder allows you to load filters directly into the core, keeping weight to an absolute minimum. You can still tilt filters for total flare control. You can use one or two filters. Either 4x4 or 4x5.65, or even a combination of both. Strong & light Now you can have both To maximise strength to weight ratio, we cut from a single block of billet aluminium, and stripped it to the core. Just because we made it light, we didn't compromise on strength. Made from hard anodised aluminium and elasto-polymer, you won't find any plastic here. Light on your pocket Heavy on features If you want to be even lighter, you can detach the shade, and just use the filters. The shade detaches in seconds. The clamp is 114mm, and you can connect to virtually any lens with our range of Misfit adaptors. Aluminum, elasto polymer, stainless steel. Without Filters: 6.9 oz (195 g) Without Filters or Lens Hood: 3.5 oz (98 g). For over 35 years we have been serving professionals as well as amateurs in the photographic, video, digital imaging and telescope fields. We offer the best combination of quality services, vast selection, knowledgeable staff, and competitive pricing. Adorama Camera is your #1 source for the best and newest products in the photographic industry, and the largest inventory of items such as Digital Cameras, Digital Camera Accessories, Memory Cards, 35mm Cameras, Medium Format Cameras, Lenses, Video Cameras, TV's, MP3 Players, Binoculars, Telescopes, Scanners, Inkjet, Dye-Sub & Laser Printers, Office Fax machines, Shredders, Projectors, Inkjet Paper, Photographic Accessories, Filters, Batteries, Cases, Tripods, Flashes, Lighting & Studio Equipment, Film, Darkroom Products and Audio Video Equipment. In an effort to comply with our Authorized Dealer contracts with the manufacturers and to best control our inventory levels we reserve the right to limit quantities or cancel orders to Resellers and Exporters. Please note: Inventory is not reserved until the item is paid for. These charges must be borne by the recipient. Adorama has no control over these charges and cannot predict what they might be. The item "Bright Tangerine Misfit Atom 4x5.65/4x4 Ultra Lightweight 2-Stage Matte Box" is in sale since Friday, June 23, 2017. 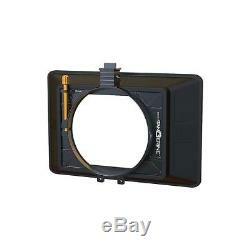 This item is in the category "Cameras & Photo\Film Photography\Movie Camera Accessories". Filter Size: 4 x 5.65"